We love sharing gift wrapping tips and tricks, but showing you is so much better than telling you about it! Bottles of nice wines or oils are popular gifts, especially around the holidays. The only thing is that they can be awkward to wrap. 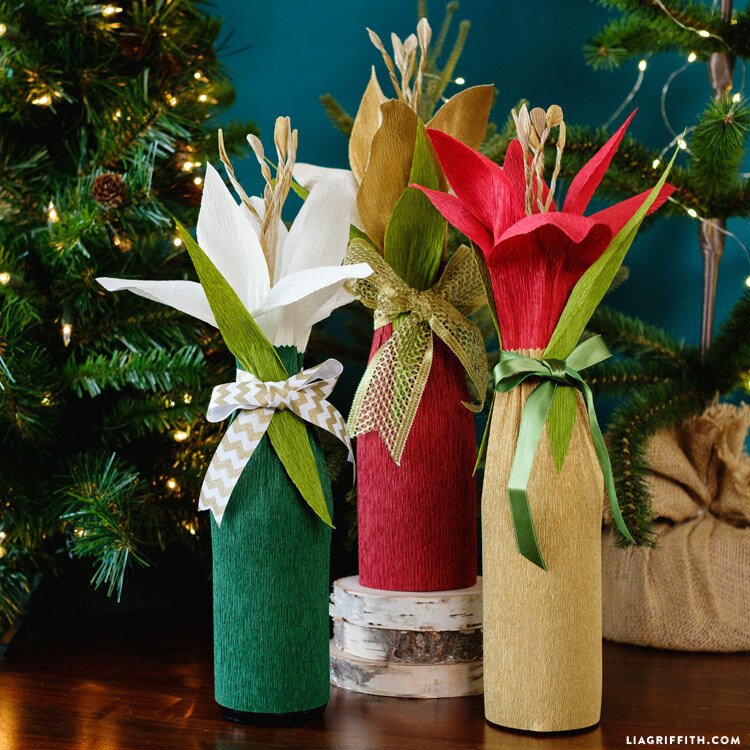 Recently we shared our project for crepe paper bottle wraps with a gorgeous amaryllis made from our holiday floristic crepe. So that you can feel more confident about attempting this DIY, we wanted to create this helpful video for a detailed look into the project. Our unique bottle gift wrap will certainly impress anyone on the receiving end, and we want to make sure you can easily achieve crafty success! This video is a part of our Handcrafted Holidays course in Craft School, along with more gift wrapping tutorials and our crepe paper poinsettias. You can find a full list of materials for this project with links on the lesson page. Once you have your materials, you will need to print the PDF template to use as a guide for cutting your crepe pieces. You can craft the bottle gift wrap in any colors you’d like of the floristic crepe – just make sure that you are using the floristic! The extra fine crepe will not be sturdy enough to create the look we want to accomplish. We specifically made a white amaryllis for white wine, a red bloom for red wine and a gold flower for champagne. This is all up to you though! Follow along with the video as you go. When you start crafting, we you can cut multiple layers of crepe at a time to speed up the process. There are lots of different bottle sizes out there, so for the body of the bottle gift wrap we mainly recommend measuring against the bottle. Our bottle happened to be 10 inches high and 9 inches around, but this is not true for all bottles! As you continue watching the video, I also go over my favorite way to tie a simple, beautiful bow with your ribbon of choice. Watch the bottle gift wrap video in Craft School! Hi Mary! This template is 11×17, so if you printed it on smaller paper it will come out too small. You can tile your pages and print at 100% if you’re not able to print at the larger size. This is gorgeous!!! Will be on my todo list for gift giving!